We’d love your help. Let us know what’s wrong with this preview of Origin of Magic by Linsey Hall. I thought I knew the world of magic. I knew nothing. By the skin of my teeth, I passed the Vampire Court trials. I’m officially an ally, with the seductive vampire Ares on my side. Everything should be good, except that there’s a magical mob boss on the hunt for dragons. Problem is: dragons are supposed to be dead. So what does he know that I don’t? It’s a race against the I thought I knew the world of magic. I knew nothing. It’s a race against the clock to save the dragons. But things get dangerous when the mob boss starts hunting me. What was a straightforward mission becomes a tangled web of intrigue and danger. I can only get out alive if I embrace my strange new magic--along with the help of Ares and my friends. To ask other readers questions about Origin of Magic, please sign up. Well the quiet little conjuror has really come into her own as Nix has faced down all the Vampire Court could throw at her and all whilst getting to grips with her new and utterly perplexing powers. Nix might have made uneasy allies but there's still the matter of Drakon and his continued pursuit of the ancient clay vase that somehow connects to a prophecy about Dragons. With Demons showing up in unexpected places and the secret of just where Nix originates from its time to buckle up as yet agai Well the quiet little conjuror has really come into her own as Nix has faced down all the Vampire Court could throw at her and all whilst getting to grips with her new and utterly perplexing powers. Nix might have made uneasy allies but there's still the matter of Drakon and his continued pursuit of the ancient clay vase that somehow connects to a prophecy about Dragons. With Demons showing up in unexpected places and the secret of just where Nix originates from its time to buckle up as yet again the author takes her readers on an amazing and non stop journey! This was a fabulous addition to the series and I'm finding Nix to be a really well developed character. Yes she's usually in their shop and pretty much knows how to handle things but as she's taken further away from her comfort zone she is really allowed to shine. Plus her heritage will knock your socks off as it's almost too cruel where her powers come from. Obviously I can't say too much but her love of nature and her connection with life itself really comes to fruition in this book. Yes there are battles to fight, adventures to face at breakneck speed and glorious interaction with a certain too beautiful for words Vampire but that ending will leave you desperate for the next instalment. The story progresses rapidly in this book. Nix finally learns about her past and her family. She also learns more about the mystery behind her power over plants and that her the true purpose behind her existence. What an exciting little morsel there is at the end and of the book. I can't wait until Book 4 is out and we discover who and what the heck Drakon is. I received and Advanced Review Copy of the book from the author for voluntary review consideration. The mystery of the dragons is beginning to be revealed and how it all links to the dragon hearts and the triumvirate this is one awesome final series and I love Nix and Ares leading us to the ultimate finale. There’s an ongoing plot about an artifact with indecipherable powers. In this installment Nix finds out that she needs to use it in conjunction with a particular potion to puzzle out the meaning of an encrypted prophecy. Del speculates about her ability to use her time-turning power to get in touch with the person who created the artifact. This left me wondering why she couldn’t just turn back time to a point where the beaker was filled with potion. That does seem to be the sort of thing she sho There’s an ongoing plot about an artifact with indecipherable powers. In this installment Nix finds out that she needs to use it in conjunction with a particular potion to puzzle out the meaning of an encrypted prophecy. Del speculates about her ability to use her time-turning power to get in touch with the person who created the artifact. This left me wondering why she couldn’t just turn back time to a point where the beaker was filled with potion. That does seem to be the sort of thing she should do, given how her powers have behaved in the past. This is part of why I don’t like history-altering powers. They tend to break worlds and create plot holes. I’m finding Nix’s new powers over plant life to be fascinating. Also her slowly growing connection to Ares–which, as it turns out, allows him to track her. I still find Nix and Ares to be the best of the three romantic couples, even though the whole “bulked, handsome, powerful, unusual, disgustingly wealthy boyfriend” thing is repeated as a formula for all three women. Although the bad guy is still fairly one-dimensional, the rest of the characters get plenty of attention. I particularly like Nix’s mother–it’s nice that the protagonists aren’t the only badass women in these books. They are as a whole depicted as strong characters. The lands surrounding the bad guy’s stronghold are also interesting, as is the local guide the women find. The effects of the bad guy’s evil on the land are fascinating. This isn’t my favorite of Hall’s Dragon’s Gift novels, but I’m still enjoying the ride and look forward to the next installment. As we remember from the last book, Nix, Del and Cass, had found this old magic beaker that some weird, wicked, guy, Drakon, just had to have. What is so valuable about this old decrepit relic anyway? They were able to get it back, but what a cost and the fight was epic! Every book we find out more about this Drakon dude. He’s one serious, black magic user if ever there was one! And we keep hearing his name and more about what the Triumvirate is supposed accomplish. This all by itself should send shivers down your spine! Nix is still the main character and Ares is popping up more and more. She seems to have the HOTS and COLDS for Ares, and he for her but they still are not sure of each other. The book begins in Magic’s Bend where Nix and Del have gone to visit Aerdaca and Mordaca, Sorceresses of the Blood kind. They find them partying and hate to interrupt but do so anyway. Once the ladies see and touch the beaker, the story unfolds. Drakon will be their target again although in round about fashion. The beaker holds the key, and is more than it seems. Nix goes through a portal finds her family, finds she and they play a key role in their search for who made the beaker. With Nix and Ares leading the charge, its all players on deck. Their goal is to find Ademius, the one who made the beaker and enchanted it. It’s not an easy task especially when one is in hiding, doesn’t want to be found. So pull up a chair get comfy and start delving into Nix and her Deirfiur as they find out just what is the Origin of Magic! I was given an ARC but the Review is mine and freely given. Mr. X has an endless supply of minions willing to kill themselves rather than be captured. So his henchmen have convenient Dragon tatoos for ease of identification before they turn to dust. The heroine has just spent the last book and three or four days fighting for her life and her biggest concern is whether her "boyfriend" of less than a week is serious about her. I'm just a guy but I didn't think women in the middle of a life and death struggle thought like that and still hope that's not norm Mr. X has an endless supply of minions willing to kill themselves rather than be captured. So his henchmen have convenient Dragon tatoos for ease of identification before they turn to dust. The heroine has just spent the last book and three or four days fighting for her life and her biggest concern is whether her "boyfriend" of less than a week is serious about her. I'm just a guy but I didn't think women in the middle of a life and death struggle thought like that and still hope that's not normal. I'm still working on my societal conditioning towards sexism and know I've got more work to do but these kind of portrayals just seem wrong to me. That the heroine was abandoned and/or kidnapped by the really bad monster as a teen, doesn't make her parents seem like prize winners. To not have issues with them because of that is better than I could ever be. I didn't need to be constantly reminded that all her friends have great tough, handsome, relatively well heeled boyfriends every third page. I don't think I'm gay but it almost made me wonder if I should be jealous of her girlfriends myself. That's not character or relationship development. I don't know what it is except that it was uncomfortable. When I first stumbled upon the Dragon's Gift series I didn't realize that there are three separate series devoted to the friends of Nix and Nix herself. So, essentially I am reading the series out of order. Although I prefer to read a series from the beginning I do not thing that it will make much difference with this one. I'm "Origins of Magic" the third book in the Dragon's Gift Protectorate series things are really coming to a head. Nix comes face to face with the last she had forgotten and we When I first stumbled upon the Dragon's Gift series I didn't realize that there are three separate series devoted to the friends of Nix and Nix herself. So, essentially I am reading the series out of order. Although I prefer to read a series from the beginning I do not thing that it will make much difference with this one. I'm "Origins of Magic" the third book in the Dragon's Gift Protectorate series things are really coming to a head. Nix comes face to face with the last she had forgotten and we learn more about the world in which she came. She is also getting closer to discovering the secrets of the vase/beakers and now she find she can no longer wait to see what Drakon has planned. She must find and try to destroy him. It really was because it’s that kind of ending that gets me all kinds of excited for what’s coming next and has me making grabby hands. But as that is the ending, and I’m not going to spoil it for anyone who has yet to read the book, we’ll get to starting about my thoughts on what led up to the ending. I’m really liking how Nix’s story is playing out. Though there are times where I do feel as if the story drags a bit, overall I’m liking how everything is unfolding overall. I feel as if we are getting to the heart of who Nix is and the role she was fated to play much quicker than with Cass and Del’s stories. Also, I’m enjoying how everything is coming full circle with the Triumvirate as well as the Drakon/dragons storyline. I’m liking how the Ares/Nix romance is moving along and hanging out with the rest of the crew is always a good time. So, with that ending and what they’ve learned about Drakon and what his plans are, I’m definitely looking forward to the next installment and where it takes us! Hahaha just read Penny Noble's review and I have to agree, it gets harder to review a series as they go, especially in my case when all I want to say is 'these books are amazing, why haven't you read them yet!' You can only say that so many times before people start questioning whether you are being paid to write good reviews. Trust me when I say I only write 5 star reviews for books I love, and ONLY for books I love (and no I don't get paid to write these reviews but I do get the opportunity to read these amazing books before they are published). In this book we finally get to find out more about Nix's family, and I love it! Origin of Magic by Linsey Hall is Book 3 of the Dragon's Gift: The Protector Series. This is a young adult, urban/fantasy paranormal series that is absolutely amazing and while it may be geared towards young adults, this series will most definitely appeal to one and all. Highly recommended to PNR and fantasy readers alike. Picking up where the last book left off, this story hits the pavement running. Origin of Magic is one helluva fast-paced, action-packed ride from beginning to end. With engagin Origin of Magic by Linsey Hall is Book 3 of the Dragon's Gift: The Protector Series. Picking up where the last book left off, this story hits the pavement running. 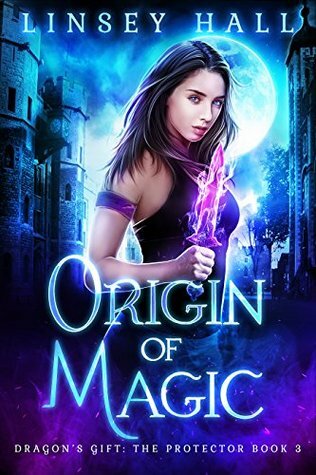 Origin of Magic is one helluva fast-paced, action-packed ride from beginning to end. With engaging characters, well-defined world, and all kinds of paranormal beings to tempt her readers, Ms. Hall’s world comes vividly to life with every creatively placed word. Ms. Hall is one super-wicked and talented writer! Nix has come a long way since the beginning of this series. She is finally coming into her power, and she learns of the fate of her family. She unites with her sisters and their beaux, and her main squeeze Ares, to pursue the evil Drakon, whose nefarious plans are close to coming to fruition. Linsey Hall has woven all the pieces of her series into a cohesive magical quilt, the last portion of which is currently available. I'm hoping when the Triumverate finally saves the world (which I've no dou Nix has come a long way since the beginning of this series. She is finally coming into her power, and she learns of the fate of her family. She unites with her sisters and their beaux, and her main squeeze Ares, to pursue the evil Drakon, whose nefarious plans are close to coming to fruition. Nix is life in the triumvirate and is the one to save them all. Now that she knows the prophecy she and her friends travel to Siberia to take out Drakon. Nix with help from her friends the vines tear Drakon apart after he almost kills her. But what comes next is unbelievable. Drakon’s body was just a shell. From the destroyed shell comes a black mist like dragon. Now to find him. Nix goes from meeting her parents, and introducing Ares (awkward) to finding out she's the reason the kingdom is dead, plants-wise. She learns a little about her Life gift, but Drakon has his troops trying to get her because she is key to the prophesy he wants to fulfill. Some wild trips to an outlaw hideout for supernaturals in Death Valley, then the showdown in Siberia keep everybody hopping. Nix is learning the truth about herself and her family while trying to find the Drakon. Her friends and Ares by her side, she is able to fight and destroy some of the evil. Yet, she still doesn't truly know the secrets that will forever change her life. Nix is a strong woman, capable of standing on her own to fight, along with her friends who are also strong powerful women. Women who are about to fight for their lives as well as the world. Am loving this series, a great instalment and Nix is proving herself every bit as worthy of her role in the triumvirate. Now that she's finding out more about her past and her magic, she is becoming a far more interesting character and I am immensely enjoying her story. How on earth Linsey Hall keeps coming up with new ideas and magic, I don't know, but this stays fresh and riveting. A great instalment and I look forward to the next. Origin of Magic is the third book in Linsey Hall's third Dragon's Gift series. Nix has learned that an evil mob boss by the name of Drakon is attempting to hunt down the supposedly extinct dragons. His motives are nefarious, and with the help of her friends, Nix plans to stop him. Overall, another exciting action-filled novel from a fantastic author. Nix found her parents and then her grandfather. He gave her the recipe to unravel the prophecy. Now Nix and her fiends are heading to confront Drakon. Not going to saw what happens, you will have to read to find out. The end of August can't get her fast enough!! That ending was perfect! Now I want more! You have set the next book up beautifully. This book was awesome and I want to say so much, but I hate spoilers. Anyone reading this book won't be disappointed and it answers so any questions about Nix and her past. Way to rock this one Linsey! Linsey said this was her favorite book to date and now I see why. This was fantastic. If you have read all the others up to now you saw the special treats in here that made it heartwarming compared to the other lady's series. If not, I won't ruin it for you. This one's was awesome, my favorite. Love all that it included and cannot wait for the next. Nix's journey continues as she many things & people come into her life. Her parents are found & new things are brought to light. This adventure continues around every bend. Such amazing characters & the storyline flows. A must read for all. Loved this book. I know I say that a lot but this book kept me guessing and living the characters and feeling like I was in the battles with them. Anytime an author helps me become vested in the characters I feel they’ve done their job as a writer. This series is fabulous. Omg I loved the ending so much! I can't wait to see what Ms. Hall has coming next. Nix has always been the one that never really stood out but she really came into her own in this book. I'm so amazed and bowled over! This story defy's logic and reason which makes the story so much more intense. Good job! Nix's journey keeps getting better and vetter. She often refers to herself as the weakest link, but she couldn't be more wrong. She draws her strength from life around her. Nix and co make their way to defeat the Drakon. Will they succeed or will they find the triumvirate defeated?